Here we are, late to the party again. But, we got tagged by Sara @ The Bibliophagist! Thank you for the great questions! You should check her out and follow her if you don’t already! This doesn’t exactly have rules, but it looks like you ask six questions and tag some people if you so choose! 1. Do you have any hobbies aside from reading? Really, I don’t know if I have a ton of them, but I role-play online and watch more TV than I should. I don’t know if I’d call either of them hobbies, but I do love them. I would say watching TV/movies and playing video games. I’m a simple person. 2. What’s the last book you added to your TBR? 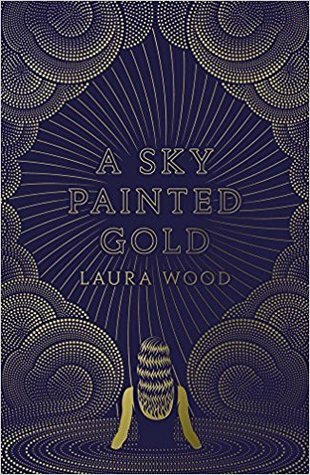 At the time of writing this, it is A Sky Painted Gold by Laura Wood. I keep seeing it all over Instagram and it sounds pretty interesting, so I’ll probably check it out sometime soon! Apparently, it was The Lady’s Guide to Petticoats and Piracy by Mackenzi Lee. Which I could’ve sworn I already had on my TBR but even if it’s on there twice I ain’t mad about it. 3. What book are you most proud of finishing? Honestly, Jonathan Strange and Mr Norrell by Susanna Clark. It’s a big book and has a lot going on in it. Plus, it had a very good ending that I was impressed by. The biggest reason why I’m proud of finishing this is because it’s told in a way that I don’t always love. Aka, footnotes. I really hate footnotes in stories because it pulls me out of the tale to look and find it, then pick back up in the middle of a paragraph or sentence, having lost the thread entirely. I did the audiobook of this in the end and loved it! You know, at one point I might have said Deathly Hallows or something else Harry Potter, but I’m going to say The Book Thief by Markus Zusak. It was one of the best books I read last year and I just couldn’t believe I hadn’t read it until then. It was beautiful and heartbreaking and I’m proud that I made it through such a heavy book. Awwwww! My fave that I recommended to you. 4. What’s been your biggest struggle with blogging? Hmm. Sometimes I think it’s interacting with people. For me, coming up with the content is pretty easy. I read a lot and I like doing tags, so I can fill up a week quickly. But reading, liking, and commenting on posts? Harder. For me personally, I’ve been struggling to keep up with the growth of the blog. I haven’t read a book cover to cover since June. I’ve been in this awful slump since February and sometimes I don’t feel up to blogging. I’m not having the best time mental health wise and sometimes you have to back off for the moment. 5. What made you decide to start blogging? Chantel did. I mean, I thought I had a large enough audience on Goodreads, so every time I tried starting a blog, I found it pointless. Why start it? But, Chantel wanted to and I decided that it would be fun. I just thought that it would be a good idea to have another person keeping me in check. I wasn’t wrong and I don’t regret it for a minute. 6. What’s your favorite social media platform and why? Either Goodreads or Instagram! Goodreads because I can keep track of my reading more easily (even though I do have a journal to help me with my monthly TBR and ratings) and is the best site for it. Instagram, because I like pretty pictures and it’s pretty user friendly for someone who hates social media. Funny enough, I love Twitter. It stresses me out and pisses me off, but I like the briefness of it. Out of all the social media out there, I lurk most on Twitter. What is your favorite book to tv/movie adaptation? Is it better than the book? What’s a book that you changed your mind about on a reread? What is your most anticipated book for the rest of the year? Why do you think reading is important? We’re not going to tag anyone for this, but consider yourself tagged if you want to take part in this! Thanks for tagging us! It was a lot of fun. I wish I could read it again for the first time.